Making The Most of Naptime : Gingersnap Maple Pecan Ice Cream: Tastes like Fall! 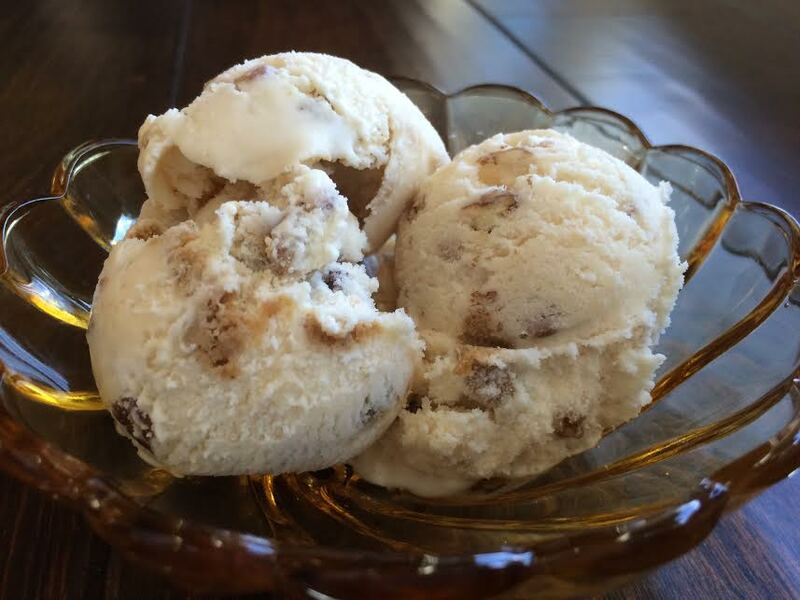 Gingersnap Maple Pecan Ice Cream: Tastes like Fall! My husband got me an ice cream maker for my birthday this past August. I think he was wary that it wouldn't get used that much... but I have proven him wrong. I think I've bought more dairy products in the past month then I have bought in the past year. I've also had to make a vow to myself that I will only eat ice cream when there is another adult in the room. It's a good way to govern my consumption given that I spend a large portion of my day alone with a four and three year old. So far I have successfully made vanilla, chocolate, strawberry, mint chocolate chip and coconut ice cream. Some of these flavors have been made multiple times. I'll have to combine all of them into one post because they all start with one tremendously awesome base recipe. Anyway... make this ice cream. This recipe is reason enough to go out immediately and buy an ice cream maker. Or, if you're a friend, knock on my door and ask me to make you some. Then I can share the calories with another and have a good visit. You have to be over 18 though so that I can stick to my solemn vow of having to eat ice cream with other adults. I joke...sort of. *Maple extract is widely available next to any other extract in the baking aisle of your grocery store. Have you ever actually looked at the variety of extracts out there? Even the imitation ones are delicious! The key is to start with a small amount.... you can always add more, but can't take an extract overload away. I toyed with the idea of using real maple syrup in lieu of the sugar, but decided against it, as I've learned you really need to leave the creaminess ratio alone in ice cream to get the creamy texture. Too much liquid that isn't creamy really throws the texture for me. That's just my preference. **By coarsely chopped, I mean about the size of a regular chocolate chip. My ice cream maker recommends not adding any chunks larger than this. *** You could use store bought ginger cookies, but I highly recommend the Lara's Tender Gingersnap recipe from Taste of Home, OR, Big Soft Ginger Cookies, also a Taste of Home Recipe, which I have previously featured on my blog, here. Start by toasting your pecans. 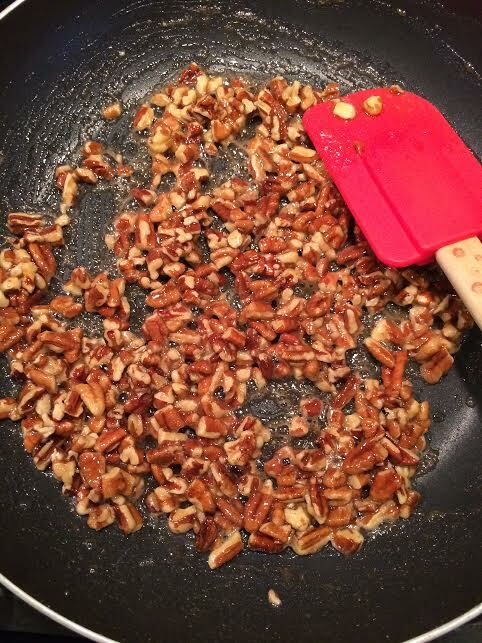 Place pecans in a small frying pan over medium to high heat and give a good shake or stir every 30 seconds or so. Once they are fairly warm and just starting to produce a delicious aroma, add butter and maple syrup. It should start bubbling at this heat right away. 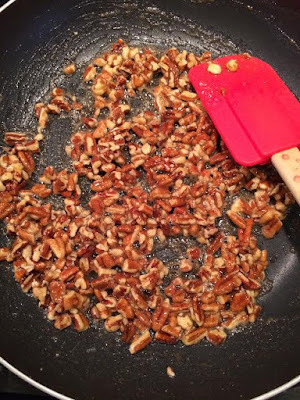 Stir constantly until syrup and butter mixture starts to evenly coat each piece of pecan and look like it's thickened a little (this should take less than one minute). At this point, remove from the pan immediately and place onto a plate to cool. They must be totally cool before adding to the ice cream. 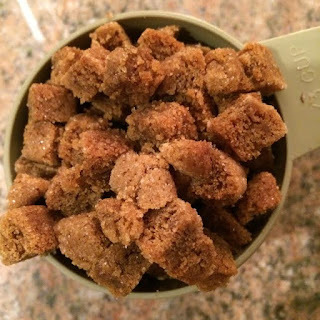 Coarsely chop the cookies and set aside. Mix together cream, half and half, sugar, and extract until sugar is nicely dissolved in the mixture. Pour into your ice cream machine and process according to manufacturers directions, adding cooled pecans and chopped gingersnaps in the last 5 minutes of processing. I add mine at the 25 minute mark. Remove from your machine and smooth into a 2-quart airtight container. Allow to freeze for approximately 4 to 5 hours before serving for the best, commercial quality texture!